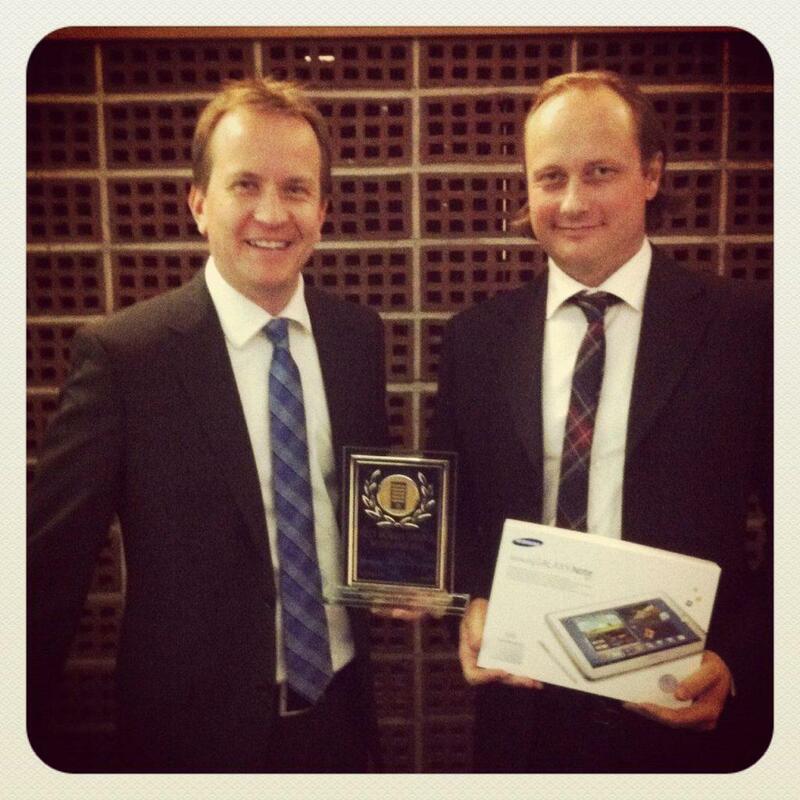 Golf GameBook’s Founders Kalle Vainola (left) & Mikko Manerus received a winning award as GameBook was chosen The Best Innovative Entertainment Service in Finland 2012. Hello Friends! This week has been one of the greatest for us, thanks to you guys! On Monday we received a phone call from Juhani Kivikangas, CEO of Teleforum ry Finland. 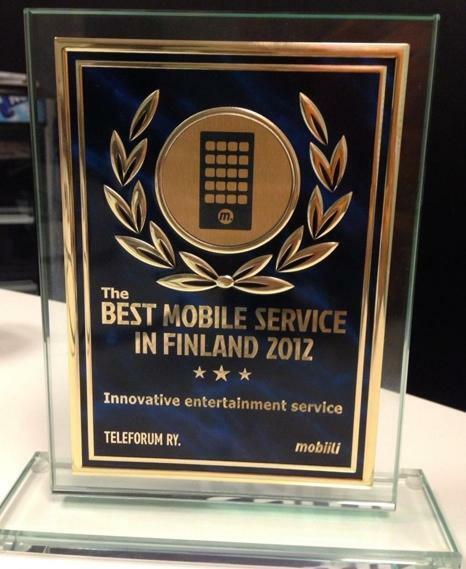 Mr. Kivikangas had some great news to tell us: we were selected as the The Best Innovative Entertainment Service in The Best Mobile Service in Finland 2012 competition! Fantastic news and what a great honor! We got a total of 225 Facebook-based likes on the competition – thank you all who voted for us during the autumn, we really appreciate your effort and are glad you like GameBook that much! Yesterday (Wednesday 7th Oct.) we attended the Digimedia Seminar here in Helsinki, Finland. Our founders Kalle & Mane had the honor of receiving the award at the prize giving ceremony. GameBook was also one of the top 3 finalists in The Best Android Application category. We want to congratulate Tellyo who won that category. Well deserved, that’s a great Finnish founded app too! Vesku Paananen (Microsoft Finland) was one of the jury members. Jury’s argument why Golf GameBook was selected as the The Best Innovative Entertainment Service in Finland was that thanks to the GameBook app, people who are not yet playing golf could now be motivated to start the game. The argument is right up our alley as that is one of our primary goals! To make golf more interesting and FUN for everybody! Mr. Paananen is well-known kite surfer himself (one to mention) ), but doesn’t play golf . Not yet, because he said too that thanks to Golf GameBook app he might give it a shot in the near future! Go for it Vesku, we promise it’s worth of it! The year 2012 is slowly coming to an end but we haven’t said our last word yet. Kalle revealed yesterday what’s coming soon and we will release that info in coming weeks. What I can promise you right now is that our next big launch is one of the coolest, one of the most revolutionary never-seen-before features in digital golf area. Don’t forget there’s a competition going on again on our Social Media sites (Facebook & Twitter). Post the best golf-themed picture you have taken, add a short story and you’re in. Great golf prizes are up for grabs once again! Introducing the free-to-enter Golf GameBook 24/7 Challenge in UK – The Biggest Ever Golf Contest for British Golfers!